I love cheesecake. I created this recipe several weeks ago, before we found out about my tests, so I could publish it for Valentine’s Day. When my husband and I were dating, cheesecake was my true indulgence and the dessert Jeff knew that I loved most. We shared many pieces of cheesecake before the wedding. Most of the desserts for Valentine’s Day call for chocolate, and you could certainly top this with chocolate instead of butterscotch if you’d like. Or, if you’re wanting to be especially decadent, go for the chocolate and the butterscotch. As part of going onto the low-oxalate diet, I’m going to have to trade in the almond meal for something lower in oxalates. I won’t be going off of almonds for another week or two and going off of all nuts is several weeks away, so I’m going to enjoy this while I still can and use up the last of my almond meal. I’m substituting 1 Tbs of raw honey and a little stevia for the sucanat. I am also omitting the butterscotch sauce and the arrowroot. That way, it can still fit within my daily carb count allowance and I can avoid arrowroot, which is also high in oxalates. Luckily, dairy is low in oxalates, so I hope to be able to re-work this cheesecake recipe to be low oxalate after eliminating and challenging dairy and eggs to make sure I’m still ok with it. Grease an 8×8 pan and set aside. In a food processor, combine the almond flour, arrowroot, baking powder and salt. Pulse until combined. And the butter and pulse until the mixture resembles coarse crumbs. Divide the mixture in half and remove half from the food processor and set aside. Place one egg into the food processor with the remaining dough and pulse until combined. Pour the mixture into a greased 8×8 pan and smooth. Bake for 12 minutes or until set. Meanwhile, place the remaining egg, sweetener, cream cheese, lemon juice, milk and vanilla extra into the food processor and process until uniformly combined. Pour over the par-baked crust and smooth to the edges. Take the remaining crust mixture and sprinkle over the top, breaking it up with your fingers if necessary. Press the crust down lightly into the cheesecake filling. Return to the oven until the top crust is browned and the cheesecake filling is set, 25-30 minutes. 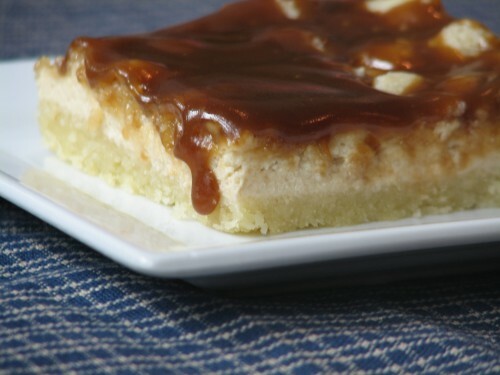 Once you remove the cheesecake from the oven, coat the top with butterscotch sauce. Cool and refrigerate until completely chilled before serving. Tell me what the arrowroot powder does in the crust. I am wondering if I can leave it out or if I would be better off subbing oat flour. I am not GF by requirement, but I do cook many GF recipes and I love almond flour for baking! I don’t have any arrowroot and have never used it. Thanks! It’s used for extra binding. It’s completely optional, and you can leave it out. Have you tried sunflower seed flour? You can make it by soaking, sprouting and dehydrating raw sunflower seeds. It’s a great substitute for almond flour, perhaps will work better for your dietary needs? Sunflower seeds are high in oxalates. I’m going to experiment with pumpkin seeds once I have time, as they are medium oxalate. They have the fewest oxalates of all of the options. Kerry, do you know where squash seeds would stand as far as oxyalates go? I toasted some the other day (butternut) and then ground them in the spice grinder. Now I don’t know what to do with it, but was thinking of just tossing it into the next thing I bake with almond flour (since it’s not very much). Thanks for a great looking recipe. Going to try this one! Karen, I believe it would fall near pumpkin seeds. They are medium oxalate, and they’re the lowest out of the nuts, seeds and legumes you could use to bake. I am making these now. My almond flour, arrowroot, baking powder and salt along with the butter is very creamy. Is this the way it is supposed to be? I don’t know how to sprinkle the remaining crust over the top. It would stick to my fingers. Sue, I’ve had it come out creamy before, and I’m had it come out firmer and easier to sprinkle. I just pinch it apart with my fingers and scatter it across the best I can. Thank you very much! I will proceed with the recipe.